Lions and Tigers and Bears, oh my… and Jaguars! Comments Off on Lions and Tigers and Bears, oh my… and Jaguars! Blakely and I have had an interesting experience we’d like to tell you about. Back in November (2014), during our annual conference here in Sarasota, Florida, I had a FaceTime talk with my then 4.5 year-old granddaughter as we do most Sundays. One of our exhibitors/presenters whom I’ve become friendly with over the years had commented that Blakely was one of her best customers, and I suggested that I introduce them during this conversation so that Blakely could put name to face. Martha Carver’s company, Bluestem Environmental and Naturalist in a Box, has a product that Blakely has fallen in love with over the years: small lunchboxes with a featured animal or mammal, a collection of foods that they eat and a sheet of information about the animal, its habitat, and eating habits. It’s a wonderful way to introduce young children to nature, the food chain, the environment and the circle of life. So we called Blakely, and she was in awe when she realized she was seeing and talking to the person who created her most prized possessions and happily ran off to gather all her boxes, animals, and binder where all the fact sheets were kept. Martha was of course enchanted by her enthusiasm and willingness to engage in conversation about her collection. She then asked Martha if she had a white bear in the collection to which Martha replied yes, and Blakely announced that was the next one she would like. I would purchase that one from Martha, and it would be one of her gifts when I traveled the 1,500 miles to the northeast to celebrate the holidays with my children and grandchildren. In January, Martha and I were emailing each other about our time with our respective grandchildren (something I do more and more with fellow grandparents these days) over the holidays, and I mentioned that Blakely had already asked if Martha had a Jaguar box. Martha quickly responded by suggesting: “I also would like to propose something new and challenging for Blakely. How about if she makes her own Jaguar Box? I will send a blank box and a Jaguar. I will also send the sticker paper that you can compose with Blakely after she does research (with some assistance) as to the cover (maybe her drawing and name of the Jaguar).” Well how cool is that? I said, and quickly emailed the challenge to my daughter, son-in-law and, of course, Blakely. They all thought it a terrific project. Blakely and her dad (a public school elementary teacher) did some online research. While Montessorians have two very distinct points of view on children under the age of six using computers, we decided that we’d explore several research methods with Blakely so that she was aware of the vast range of information available in different formats. In early March we all met up in person for a weekend of family fun. Blakely and I went off to the local public library for some one-onone time to work on this project. Long gone are the days of the card catalogue (paper index card files with hand-written and then typed out information about where to locate a book within the library’s stacks). But I did explain that to her just for some background and history. I had weeks earlier emailed the librarian and asked her if they had a paper catalogue file and, if so, could we see it. While the librarian was most helpful and emailed me right back to say it was all online, they did have a poster of the Dewey decimal system and several books she knew about on our subject matter, so I knew we would be successful. She even said we could check out the encyclopedia volume relevant to our search, but we will just use it there. Our thanks to Ms. Darling at the Stirling, NJ library for her help with this project as well. 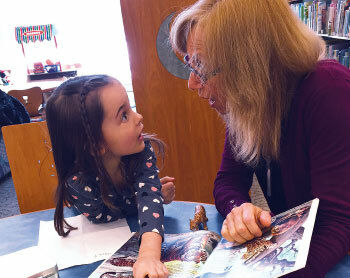 Librarians are great resource people to introduce your child to, so don’t be afraid to contact them and see if they can set up a tour or some informational face-to-face time with you next time you go to the library. When Martha and Blakely finish their project, we will report on how it looked in an upcoming issue of Tomorrow’s Child. In the meantime, invest in your grandchildren with your time and knowledge, create memories for both of you, and enjoy each and every minute with them. Margot Garfield-Anderson has worked for the Montessori Foundation for the past 15 years in many capacities. Blakely Jayne Thornton turned 5 on March 21, and has been a Montessori grandchild her entire life.